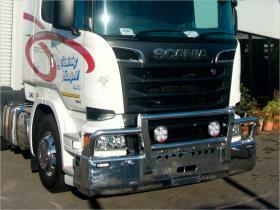 Scania G500/P450 low profile high tensile polished aluminium FUPS approved bullbar. The large opening in the lower bar allows the AEB (Advanced Emergency Brake) and the ACC (Adaptive Cruies Control) to operate without any interference from the cab protection awarded by the bullbar. 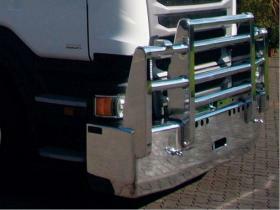 10mm thick heavy duty high tensile aluminium main channel with 2 tow points. Custom extruded centre main pipe to accomodate light bar or driving lights. Combination indicator repeater/daylight running lights are recessed in the lower channel. Total weight =100kg. 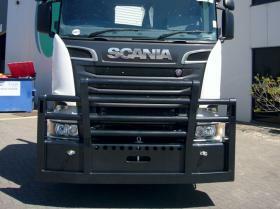 Scania XT R620 Custom Built High tensile powder coated aluminium bullbar. Features 76mm high tensile aluminium pipe with 25mm thick high tensile aluminium end plates and backing plate. This custom built bullbar adds no increase to the forward projection of the standard Scania XT R620 and only adds an additional 45kg to the tare weight of the cab-chassis. The main channel is fitted with a removable heavy duty tow pin and offers no obstruction to the AEB (Advanced Emergency Brake) and the ACC (Adaptive Cruise Control) allowing it to operate without any interference from the cab protection awarded by the bullbar. Reflectors are fitted to end plates, Company Logos can be engraved on the end plates at an additional cost. These bullbars can be supplied fully polished or powder coated to your choice of colour from the available colour range. 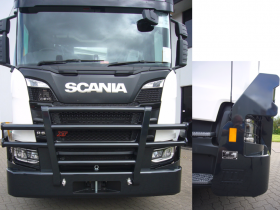 Scania R650 new generation FUPS Bullbar. The opening in the lower bar allows the AEB (Advanced Emergency Brake) and the ACC (Adaptive Cruise Control) to operate without any interference from the cab protection awarded by the bullbar. Combination indicator repeater/daylight running lights are recessed in the outer box uprights. 76mm high tensile aluminium pipe with 6mm thick wall and custom driving light mounts to customer requirements. 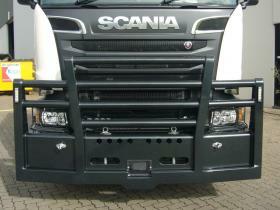 Scania R730 high tensile aluminium FUPS approved bullbar. Reversible Road Train signs on alumium plates. Powder Coated black to customer spec, a choice of colours is available.The large opening in the lower bar allows the AEB (Advanced Emergency Brake) and the ACC (Adaptive Cruise Control) to operate without any interference from the cab protection awarded by the bullbar. Combination indicator repeater/daylight running lights are recessed in the outer box uprights. Heavy duty mesh protection for headlamps. 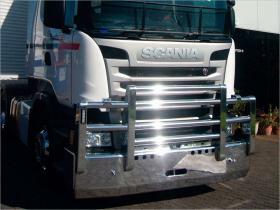 Scania G440 low profile high tensile aluminium FUPS approved bullbar. This design allows full access through the front panel for daily checks. The large opening in the lower bar allows the AEB (Advanced Emergency Brake) and the ACC (Adaptive Cruies Control) to operate without any interference from the cab protection awarded by the bullbar. Combination indicator repeater/daylight running lights are recessed in the lower channel. 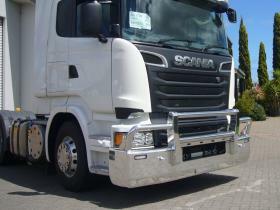 Scania R620 low profile high tensile aluminium FUPS approved bullbar. This design allows full access through the front panel for daily checks. The large opening in the lower bar allows the AEB (Advanced Emergency Brake) and the ACC (Adaptive Cruies Control) to operate without any interference from the cab protection awarded by the bullbar. Combination indicator repeater/daylight running lights are recessed in the lower channel. 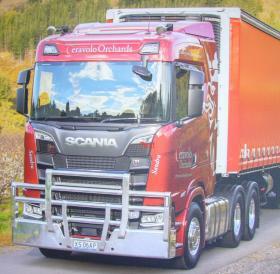 Scania R560 hi-tensile aluminium FUPS bull bar low styling. Significant reinforcing on bent corner pipe into structure of bull bar channel on this model. Heavy duty tow pin in steel backing plate. 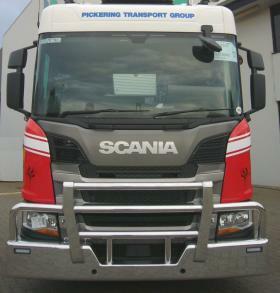 Scania R560 high tensile aluminium 4 post FUPS bullbar twin main 76mm full width cross high tensile tubes. Driving light mounts to suit customer requirements. Main bar is fitted with the factory fitted fog and auxiliary lights and provision for AEB (Advanced Emergency Brake) and the ACC (Adaptive Cruise Control) to operate without any interference from the cab protection awarded by the bullbar. Tow pin and heavy duty steel backing plate. The outer uprights are fitted with indicator repeater lights. 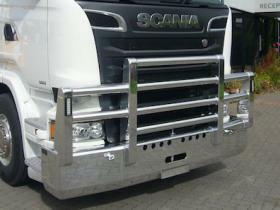 Scania R Series hi-tensile aluminium FUPS bull bar. Indicator lights in upright. Optional spotlight shown that give maximum distance from back of light to grill. Choice of 76mm dia or 88mm dia pipe. Tow pin and heavy duty steel backing plate. Bull bar can be custom built to your specification. Scania R730 high tensile aluminium 4 post FUPS bullbar twin main 76mm full width cross high tensile tube with lower and upper tubes for grill protection. Showing reversible aluminium road train signs. Driving light mounts to suit customer requirements. Tow pin and heavy duty steel backing plate. 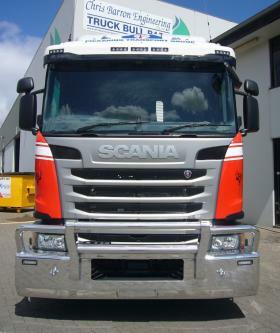 Scania R480 hi-tensile amulminium FUPS bull bar. Indicator lights in upright. Optional spotlight mounts shown that give extra distance from back of light to grill. Heavy duty tow pin mounted in backing plate. 76mm heavy duty cross tubes. 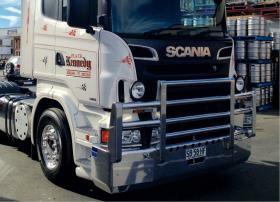 Scania R480 hi-tensile aluminium FUPS bull bar with driving light mounts, heavy duty tow pin, aero underbar. Can be custom built to your specification. 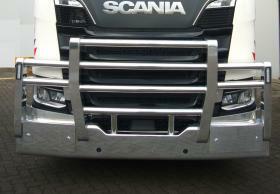 Scania P400 Low profile FUPS high tensile aluminium bull bar with one piece shaped 76mm dia. pipe outer uprights and cross pipe. Indicator repeaters fitted to main bar, heavy duty tow pin mounted in steel backing plate. Driving light mounts can be fitted as required. 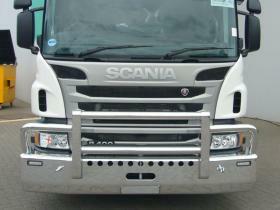 Scania R620 hi-tensile aluminium FUPS bull bar, 76mm heavy duty cross tubes passing through drilled uprights. Indicator/Daytime running lights recessed into the outer main uprights. Heavy duty steel backing plate with tow pin. Custom driving light mounts to customer specification. 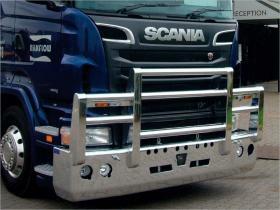 Scania hi-tensile alumimium FUPS heavy duty bull bar. Can be powder coated to the colour of your choice. steel tow pin and heavy duty backing plate, Choice of 76mm dia or 88mm dia tube.Driving light mounts as requested. Bull bar can be custom built to your specification. 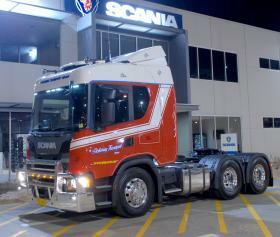 Scania R620 hi-tensile radar compatible alumimium FUPS heavy duty logging truck bull bar. Can be powder coated to the colour of your choice. steel tow pin and heavy duty backing plate, Choice of 76mm dia tube. Boxed uprights shaped to suit grill and allow maximum air flow. Plates fitted to channle to prevent the eye-bolts damaging the powder coating. Driving light mounts as requested. Indicator repeaters fitted to outer box uprights. Bull bar can be custom built to your specification. 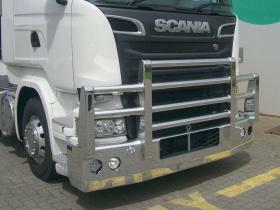 Scania R620 high tensile aluminium FUPS approved bullbar. The large opening in the lower bar allows the AEB (Advanced Emergency Brake) and the ACC (Adaptive Cruise Control) to operate without any interference from the cab protection awarded by the bullbar. Dual tow points in the main channel. 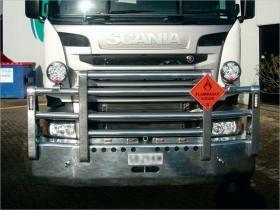 Flip over Road Train signs on polished aluminium plates. Combination indicator repeater/daylight running lights are recessed in the outer box uprights. Features four heavy duty high tensile aluminium box uprights and 6mm wall high tensile aluminium tube.